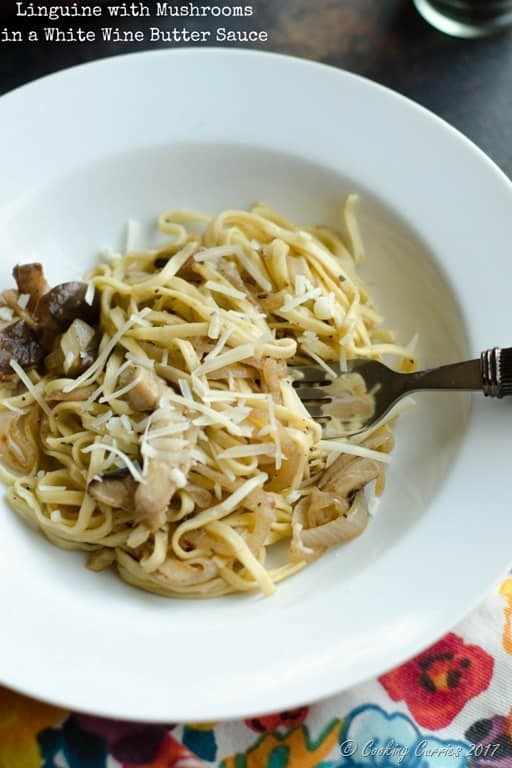 Fresh linguine cooked with mushrooms in a light yet decadent white wine butter sauce. Make your everyday dinner a little more fancy with no extra effort with this delicious pasta recipe. I do not hate tomato based sauces – marinara or arabiatta or bolognese. Same as I don’t hate a creamy white sauce like alfredo. I just always prefer a light non-sauce pasta sauce similar to this White Wine Butter sauce over tomato based sauce or creamy cheese sauce, any day. A light and fresh sauce is a must if you are making fresh pasta and not the dried boxed ones. I have made fresh pasta, the from scratch kinds, at home only a couple of times. I have been debating between getting a hand cranked pasta machine and a Kitchen Aid pasta attachment. Till I decide on one, I indulge myself and my family to fresh made pasta from our local grocery store PCC or from Whole Foods. If you haven’t yet tried cooking with fresh pasta, you should definitely try it once. It will seriously be difficult to go back to the box ones after this. But you still need those in your pantry, stored and ready to go when you suddenly decide to make pasta. Also, the fresh ones are not available in all the different types you need. I have only usually seen linguine, fettuccine or spaghetti or filled ones like ravioli or tortellini. Fresh pasta also takes way less time to cook than the dried ones. 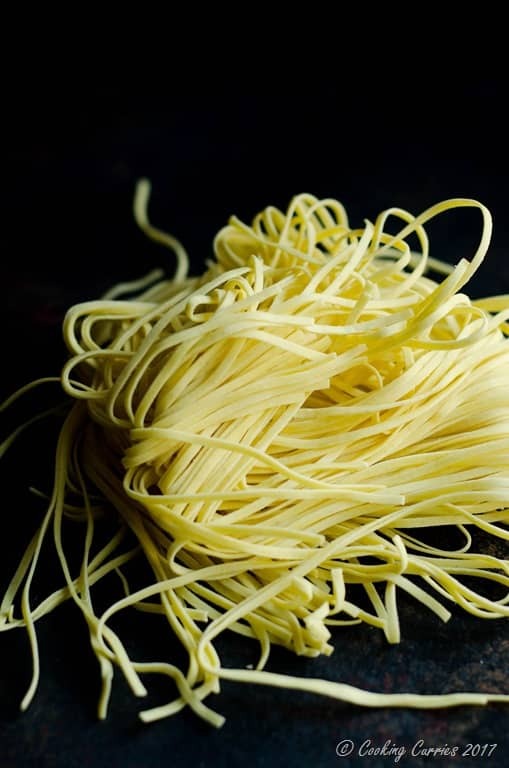 So keep that in mind when you buy and cook with fresh pasta, otherwise you will end up with an overcooked mass that is all clumped up together and not the beautiful al dente pasta. 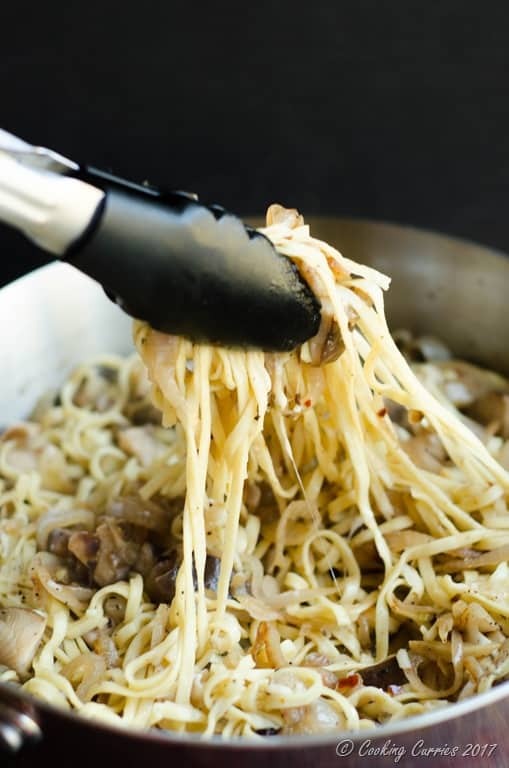 The shallots in the pasta give this a much needed oomph along with some sweetness and the mushrooms give some texture and substance to it with their umami. The white wine butter sauce just lightly coats the pasta in such a way that you wont even know it is there, but it definitely keeps the pasta from drying up. Do give it a try and let me know in the comments below how you like it. Cook the linguine in salted water as per instructions on the packaging. Drain and keep aside. Heat he butter and olive oil in a pan and add the shallots and garlic to it. Once the shallots start to soften, add the mushrooms to it. Let the mushrooms soften. Now add the white wine, red pepper flakes, crushed black pepper and salt. Add the drained pasta to this immediately and toss well. Remove from heat. Toss the asiago cheese to it and serve immediately. I love cooking with wine. There is so much added flavor potential there. 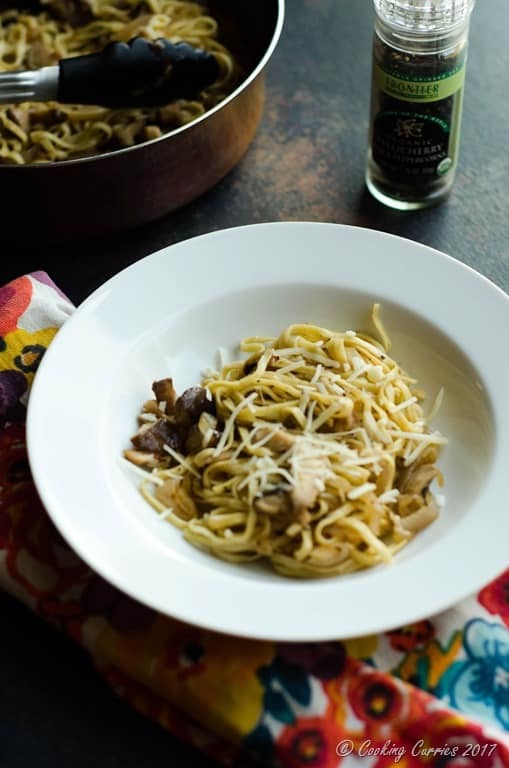 Pasta with wine and mushrooms is always a favorite in my house. 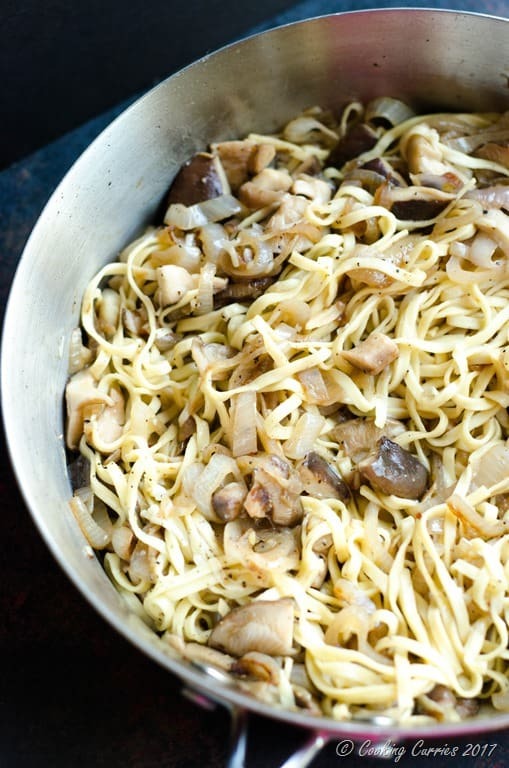 I love mushrooms with pasta! What a delicious recipe! Pasta and mushrooms goes very well together. I want to make soon:) Thanks ! I made this tonight. I substituted Ravoli. Wonderful. But next time will use 1/2 tsp of Red Pepper flakes. A Tsp was wayyyyy to heated. Absolutely understand the heat factor from the red pepper flakes. My tongue is a little too seasoned for spice ? But glad you liked it! Ravioli in it sounds like a wonderful idea! Thank you for letting me know! ? Thank you Bonnie. Your modifications sound fantastic! ?